Locking Outside Door Handle for the 1928-29 Model A Ford. These are used on the 1928-29 Coupe and Tudor Sedan. Chrome plated. Comes with 2 keys. (Rubber pads available seperately). Non locking door handle for the 1928-29 Model A Ford. Truck Outside Handle 1928-29. A very nice reproduction! Chrome with the black insert. It also fits the 26-7 model T closed car. Door Handle Pad set for the 1928-29 Model A Coupe and Tudor sedan. These are the flat rubber pads that go between the outside door handle and the body. Set of 2. Made in USA. Locking Outside Door Handle for the 1930-31 Model A Ford. These are used on the 1930-31 Coupes, Tudor sedan and the 1930-31 Closed Cab Trucks. Chrome plated. Comes with 2 keys. (Rubber pads available seperately). Non locking door handle for the 1930-31 Model A Ford. Door Handle Pad set 1930-31 Closed Car. The two flat rubber pads that go between the outside door handle and the body. set of 2. Made in USA. Stainless outside door handle as used on the 1928-31 Model A Ford Roadsters and the Phaetons. (Rubber pads available seperately). Chrome outside door handle as used on the 1928-31 Model A Roadsters and the Phaetons. (Rubber pads available seperately). Door handle pads 1928-31 Open Car, plus the 1928-29 closed cab pickup. The rubber pad fits between the body and the door handle. It's the finishing touch. Made in USA. Set of 2. Scroll Outside Handle 1928-29 Right Front/Left Rear. These are the scroll style for the 4-drs, and the Cabriolets, and Victoria. (Rubber pads available seperately). Scroll Outside Handle 1928-29 Left Front/Right Rear. These are the scroll style for the 4-drs, and the Cabriolets, and Victoria. (Right front shown). Rubber pads available seperately. Scroll Outside Handle 1930-31 Right Front/Left Rear. These are the scroll style for the 4-drs, and the Cabriolets, and Victoria. (Rubber pads available seperately). Scroll Outside Handle 1930-31 Left Front/Right Rear. These are the scroll style for the 4-drs, and the Cabriolets, and Victoria. (Right front shown). Rubber pads available seperately. Scroll Locking Handle 1930-31. This scroll locking handle was used on the 4-door sedans, Victoria, Cabriolet and the Convertible Sedan. It was used on the right front door. Comes with 2 keys. (Rubber pads available seperately). Door Handle Pad set 1928-29 Fordor. Flat rubber pads that go between the outside door handle and the body. Set of 2. Made in USA. Door Handle Screws 1928-31. The four machine screws that hold the outside door handles on. Made in USA. Wood Door Handle Screw set 1928-31. If you have a 4-door or a car that takes wood screws to mount the outside handles, this is the kit. Made in USA. Door Handle Cup & Spring for the 1928-31. Special cup washer and spring that is crimped onto the closed car outside door handles under the escutcheon. (1set per handle). Made in USA. 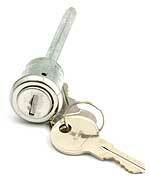 Door Lock Cylinder for the 1928-31 Model A and the 1932-52 V8 car and pickup . 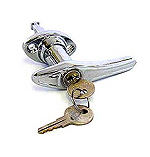 This lock cylinder is used on the cars and trucks that have a separate lock cylinder located under the regular door handle. Square shanks is 3/16" and 3" long. 1928-31 Sliding Door Lock assembly for the Coupes and Tudors. It is the lock for the left hand door on the inside. Slide Lock Screws for the 1928-31. The little flat headed machine screws that hold the slide lock in the door. Made in USA. Lock Knob for the 1928-31 Coupes, Tudors and 30-31 Pick-ups. It screws on the stud of the slide style door lock. Door Lock Knob for the 1928-31. This is the twist type that fits most Fordor Sedans. Inside Door Handle 1928-31 in Chrome. This door opener is an exact copy of the original standard handle used on: 1928-31 Coupe, 1928-29 Special Coupe, 1928-31 Sport Coupe, 1928-29 Business Coupe, 1928-31 Tudor Sedan, and 1930-31 Pickup Trucks. 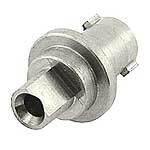 Sleeve nuts for mounting must be purchased separately. Inside Door Handle 1928-31 in Nickel. This door opener is an exact copy of the original standard handle used on: 1928-31 Coupe, 1928-29 Special Coupe, 1928-31 Sport Coupe, 1928-29 Business Coupe, 1928-31 Tudor Sedan, and 1930-31 Pickup Trucks. Inside Door Handle for the 1930-31. 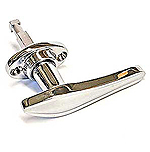 This handle was used on 30-1 Victoria, 30-1 Cabriolet, A-400's, and some 4-door Sedans. This is a twist style handle instead of the normal 'lift-up' style of handle. Mounts on a 3/8" square shank. Chrome. Door Handle Sleeve Nut 1928-31. These nuts have threads on the inside, and hold the lift-up style door handles on the shaft. Special lock washer is included. Chrome. Made in USA. A nice chrome inside door opener for the Roadsters and the Phaetons. Open car escutcheon kit. Each kit consists of 2 nickel plated washers and 2 rubber washers. They go under the inside door opener of all Roadsters and 4-dr Phaetons. Made in USA. Quarter Window Handle 11930-31. This 'T' handle was used on the 30-31 Coupes that had the roll down rear window, and on the 4-door Sedans that had the quarter windows that went up and down. Door Escutcheon for the 1928-31. This escutcheon is 1/2" high and 1-3/8" diameter. Made of stainless for the Cabriolets and the 4-dr Sedans that had the twist type door openers. Also used on the riser handles of those cars. Made in USA. Slide Lock Escutcheon for the 1928-31. Goes between the upholstery and the slide lock knob on the driver side door. This is the scroll deluxe style. Chrome. Standard Slide Lock Escutcheon for the 1928-31. The standard design escutcheon for the slide lock. Made just like the originals. Made in USA. Model A Ford Deluxe style escutcheon used with the deluxe style door openers. The standard design escutcheon for the door opener handle. Made just like the originals. Made in USA. Door pull escutcheon for the 1930-31 Deluxe Phaeton in Nickel plated brass. Protects the door panel where the door pull slides. Original plain rim design. Made in USA. 1928 Upholstery trim Hardware Set. Used on the 28's only, these metal trim pieces finished off the door panel around the striker, dovetail, and the door opener. 1 set does both doors. Will only work on original style panels that were merely a piece of hardboard that was bound. Most door panels today are covered and bound hardboard which is thicker than the originals. Made in USA. Key Blank 1928-31. For the door cylinders. (Except Crown locks). Made in USA.